I’ve been spending time working on my set of 3rd great grandparents, stemming from my paternal grandmother, Alice (Waege) Rathkamp. Lately I’ve been on a bit of a roll, discovering some of their home towns in what was then Pomerania and now is part of Poland. 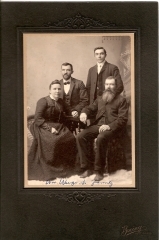 Originally, this post was going to be about the really interesting fact that not only did each of these four families live within a 20 mile radius of each other in Dodge and Fond du Lac Counties of Wisconsin, but also that is seems they may have originated from within a 20 mile radius in Kreis Naugard, Pomerania. To make this discovery, some of the information I used was known, some of it was “guessed” by using the database on Kartenmeister. This website allows you to enter surnames of ancestors from Pommern, with the results showing the former German name and the current Polish name for the village of origin. I then plugged the Polish name for each village into Google Maps to discover the close proximity of the villages possibly inhabited my Wege, Justmann, Leitzke, Brockhaus, Gehrke, Wesenberg, and Viergutz ancestors. However, I was missing the surname of my 3rd great grandmother, Louise, married to Johann G. Leitzke. So I then went to the beta FamilySearch database where I made a somewhat shocking discovery. There is marriage information for Louise Leitzke, a daughter of Johann and Louise. It turns out Louise’s maiden name is also Wege. Her birthdate is December 1823, making it entirely possible that she is Friedrich Wege’s sister. If that’s true, it means my 2nd great grandparents, William Wege and Wilhelmine Leitzke were 1st cousins. I need to find the parents of Friedrich and Louise to confirm this. Just goes to show you should keep your friends close and your relatives even closer.